Fox News president Roger Ailes announced yesterday the hiring of viciously anti-gay activist Alveda King. 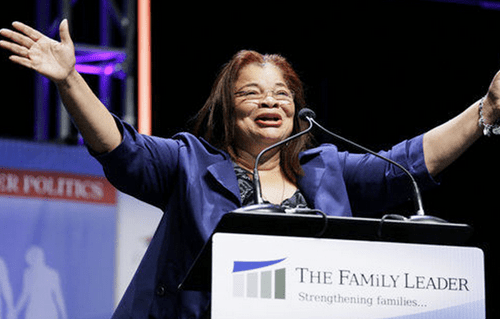 Alveda King has besmirched her uncles great name for decades by using it for right-wing extremist causes and she herself is viciously anti-gay. “Alveda has brilliantly carried the legacy of the King family to the next generation and has been a source of inspiration for many Americans,” Ailes said in making the announcement. “Her passion and mission for social change will be a valuable contribution to our network.” King is a prominent anti-abortion activist and serves as director of African-American outreach at Priests for Life. She has also courted controversy by speaking out against LGBT rights, proclaiming in 1998 that “God hates homosexuality” and comparing gay marriage to genocide in a 2010 speech. Alveda who has been cashing in for years on her uncles last name is severely homophobic and bigoted “christian” who has cast her lot with the extreme right GOP and use her uncles name to earn money to push their her anti-gay agenda. Leave it to FOX News to hire another disgusting pig for their God awful poke.